In the past, drawing or painting on a flattened smooth box or some handy corrugated cardboard was the natural thing for Dana to do on those occasions when she ran out of the good paper--the deckled edge watercolor kind that soaks up ink and paint so superbly. 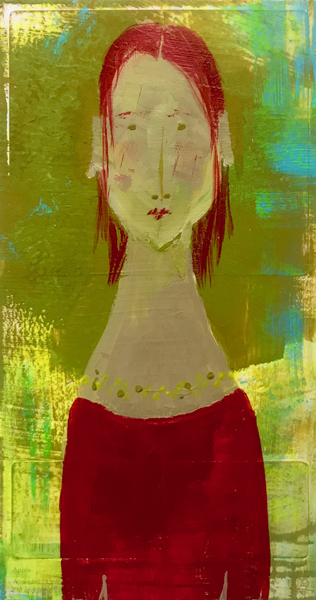 During the past year it became apparent to her that the portraits she so loves to do actually take on a different attitude if they are painted on discarded materials. The foundation color peeks through more easily on cardboard. The flattened box edges provide boundaries to the portrait and emphasize the shapes she is preoccupied with. Painting faces “is what I do”, says Dana. “It’s what comes up for me when I pick up my charcoal or paints. I love the geometric, almost symmetrical shape of the face, neck and shoulders. I try to capture the gaze of the person I am observing.” Rather than attempting to replicate an exact likeness photographically, she may exaggerate part of her composition. Sometimes the neck is elongated in the manner of Amedeo Modigliani. Sometimes, following Paul Klee’s lead, she uses black line and childlike simplification of forms. Sometimes she begins by recalling the drawings that her daughter made years ago at age four. She intuitively knows that, “One eye sees, the other feels,” as Klee once remarked. Dana’s first solo at Touchstone Gallery reflects these attitudes. beg borrow + steal: works on cardboard delights the eye with figures installed sans glass. Some are separated from the wall by brightly colored vintage frames. Others float on the wall flaunting their rawness. One stands alone four-sided on a pedestal. This new work belies the journey Dana has taken over time. As a young woman Dana felt like a fish out of water at James Madison University, so she gave up her art minor there, and answered the call of a cooler climate in the North. Equipped with snow boots, warm clothes, and her little box of paints, she enrolled in Tufts University in Boston. She completed a graduate degree in counseling psychology two years later. The climate suited her, so she went to Garden City on Long Island NY, and obtained a doctorate at the Adelphi University's Derner Institute. Dana married a Jersey boy there and then relocated back to Virginia again—paint box still along for the ride--where she maintains a psychotherapy practice along with the job of motherhood. for the ride--where she maintains a psychiatric practice along with the job of motherhood. Feeling the lifelong urge to paint at age 40, Dana opened up her trusty paint box and began making small “hidden” paintings while entertaining ideas for big ones. A gift certificate for a gesture drawing class at the Art League in Alexandria changed everything. “It was as though I had awakened in another country where I didn’t know the language,” she recalls, “but I kept going, learning and collecting papers and enjoying how each absorbed pigment differently. Corrugated cardboard textured surface does the same thing as a gesture drawing class does. It stops me from fretting over the process. It’s a gift that helps me bypass anxieties about trying to ‘get it right’.” Once her creative genie got out of the box, there was no stopping the flow of artwork and the enjoyment found in the painting process.